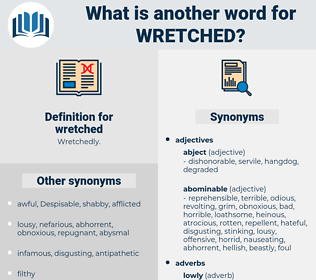 What is another word for wretched? deplorable, lamentable, pitiful, horrible, impoverished, disgraceful, terrible, desperate, horrendous, despicable, hopeless, horrific, cursed, shabby, measly, woeful, accursed, regrettable, hapless, paltry, hideous, dismal, destitute, worthless, vile, rotten, inclement, abhorrent, ghastly, ill-fated, heinous, damn, horrifying, miserly, distressing, goddamn, disastrous, horrid, gruesome, frightening, seedy, bloody, depressing, God-forsaken, shameful, chickenshit, depressed, crappy, bad, sorrowful. 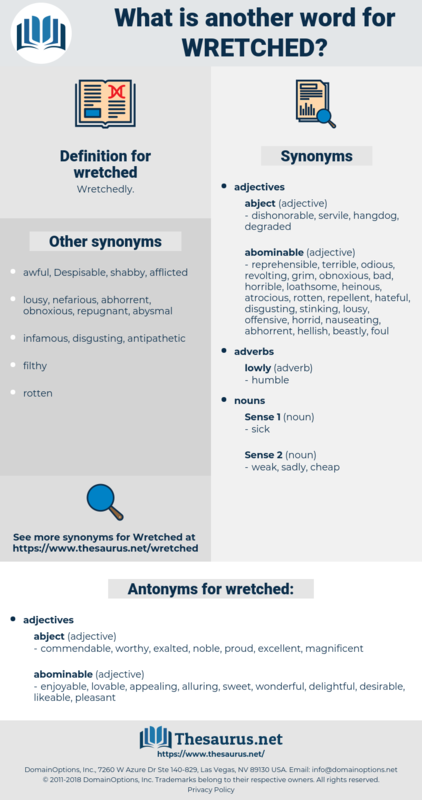 pathetic, appalling, unfortunate, lousy, squalid, dreadful, poor, pitiable, abject, dire, atrocious, misery, awful, damned, abominable. commendable, worthy, exalted, noble, proud, excellent, magnificent. enjoyable, lovable, appealing, alluring, sweet, wonderful, delightful, desirable, likeable, pleasant. honorable, admirable, respectable, loved, admired. high-minded, useful, lively, commanding, comfy, blameless, exceptional, frisky, borderline, minimal, excited, vivacious, premium, handsome, smiling, friendly, average, noticeable, beneficent, classical, helpful, standard, mighty, springy, cordial, Sprightful, notable, sanguine, noteworthy, cheering, vital, happy-go-lucky, jaunty, elegant, peppy, first class, easygoing, right-minded, unerring, sublime, so-so, reputable, unimpressive, upright, keen, redoubtable, boon, refined, uncorrupted, presentable, proper, sufficient, insouciant, devil-may-care, handcrafted, straight, carefree, thrilled, uninspiring, gladsome, gladdened, unexceptional, buoyant, incorruptible, guiltless, high-grade, sprightly, dignified, comforting, energetic, heartened, glorious, mediocre, right, unconcerned, special, zippy, suitable, lightsome, cavalier, scrupulous, high, outstanding, spirited, A1, grinning, virtuous, polished, beaming, careless, exuberant, fancy, bouncing, exultant, seemly, heartwarming, sensational, august, content, Buoyed, better, chipper, jubilant, middling, perky, mean, overjoyed, sunshiny, animated.
" You mustn't mind, Tom," she said, in a low voice, " for I'm a bad, wretched girl." After about two weeks we arrived at New York, and were put on board that wretched ship the Jersey.